It is that band of rough seas that makes Alonissos so special from an ecotourism standpoint. 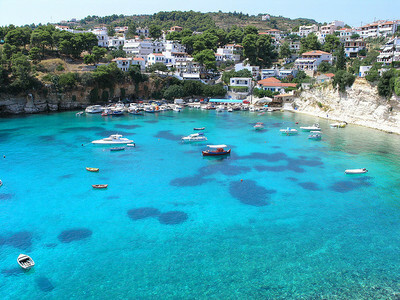 Although one of the smallest inhabited islands in the area, Alonissos and its environs contain one of the richest ecological and archeological sites in the region of the Mediterranean Sea. We were surprised to see a magnificent ecosystem of rare red coral, Eleanora’s Falcons and Audouin’s Gulls, common and striped dolphins, long-finned pilot whales, sperm whales, Cuvier’s beaked whales and all kinds of fish thriving in these turquoise waters. My son adored the fact that he could jump into the water and swim with fish making their way all around him. I’ve had the good fortune to travel to no less than seven Greek islands, including the famed Santorini, but for sheer natural beauty, none can hold a candle to Alonissos. Its lush, dense forests of pine and oak trees, mastic and arbutus bushes as well as ancient olive and fruit trees that go all the way to the coast are remarkable. However, the big attraction and reason that Alonissos turned to ecotourism rather than the mass tourism route followed by so many other Greek islands is the Mediterranean Monk Seal. We interviewed Captain Athanasiou, a boat operator, and Kostas Mavrikis, the founder of the island’s only historical museum, and learned that this species of seal is very closely tied to Greek heritage. It features in the writings of Homer and Aristotle and its image adorned the earliest coins, dating back to 500 BC, and elevated it as an ancient symbol of good fortune. Unfortunately, poaching during the Roman era and pollution during the modern era throughout the Mediterranean Sea threatened the dwindling population with extinction. In fact, through the 1980s, the global scientific community considered this seal species to be extinct, not knowing that the seals were living around Alonissos. No one outside this remote island knew they were there because at the time, Alonissos did not have electricity, much less a large port to facilitate communication. “It was like a gift from God,” explained the Captain and a chance to save a culturally significant species that was thought to be lost. It made me wonder how many other remote areas of the world have natural or medicinal treasures about which we know nothing. I continued filming the Monk Seal documentary while answering my six-year-old son’s many questions about the flora and fauna that made the island so special. One afternoon, after we finished a tour of the National Marine Park, I asked my son what he had learned that day. He said “don’t pollute or else the animals will die. If you pollute too much, it will be bad for the air and no fishermen could fish and....” His new-found consciousness of how one person’s actions can affect an ecosystem could not have made me more proud. Our family met Eleni, a co-founding member of the Monk Seal conservation group (appropriately called MOM), which has spearheaded the effort to enforce fishing and tourism restrictions in the National Marine Park and developed a rehabilitation center for orphaned seals on Alonissos. After speaking with Eleni, I was galvanized by the notion that a small group of 5 marine biology graduates from the University of Athens, with no financial support and an uphill political struggle, started a movement in the late 1980s that has captured Greece’s attention. It’s unbelievable! Young and old - they all know about MOM! Also, it’s a great example of how a community working together toward a common goal, rather than against one another for recognition, can create a win-win situation for conservation. 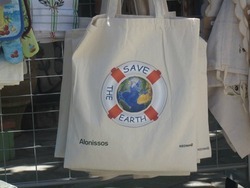 Ultimately what I learned about the history, political issues and economic goals for Alonissos was translated into a speech for an ecotourism conference and into a short documentary that captured the attention of Rare Planet. The organization saw the piece and contacted me to ask that the conservation project be entered into an international search for successful and repeatable coastal conservation solutions. MOM not only got a well-deserved spot in the sun for their work, but they became eligible to win a $20,000 grant. Unfortunately, they didn’t win. But, MOM got recognition as one of only three such efforts in Europe and our family got an authentic ecotourism experience filled with lessons about nature, culture and mutual respect. Irene Lane is the founder & president of Greenloons, a company dedicated to providing nature enthusiasts and wildlife conservationists worldwide with trusted information about responsible, sustainable, and third-party certified family ecotourism travel vacations. Lead photo by Rupert Brun via flickr common license. All others courtesy of Irene Lane.